Sir Richard Branson, founder of Virgin Group, is bringing business leaders together to build a better world. The first time I saw Sir Richard Branson in action was eight years ago at the launch of Virgin Mobile in Canada. Branson, billionaire founder of Virgin Group, made a grand entrance by zip-lining from the top of a building to a public square in downtown Toronto. Sporting red tights and looking like Flash Gordon, Sir Richard was hardly on the ground before being surrounded by three blonde “nurses” dressed in mini-skirts. Women’s rights groups were not impressed. Doing crazy, headline-grabbing stunts is nothing new to the entrepreneur with the stylin’ goatee, who describes himself on his Twitter account as a “tie-loathing adventurer and thrill seeker.” It’s just business, after all – and there are many in Branson’s empire, which began with a record label in 1972 and now includes an airline, railway, space tourism company, bank, comic book venture and health care provider, to name a few. Indeed, Virgin is now the brand behind more than 300 companies in 30 countries. It has all made Branson, 62, one of the richest individuals in the United Kingdom, with a net worth according to Forbes magazine estimated at $4.2 billion. But he doesn’t plan to keep it all. In February, it was announced that Branson was among the first batch of non-U.S. billionaires to sign on to The Giving Pledge initiative launched by Warren Buffett and Bill and Melinda Gates three years ago. By doing so, Dr. Yes (that’s what Branson’s staff at Virgin call him) made a moral commitment to give half of his wealth to philanthropic causes or charities, either before or after his death. Branson, in fact, has been on that track since 2004. That’s when he founded the non-profit foundation Virgin Unite to tackle social and environmental problems in entrepreneurial ways. Three years later, he established the Virgin Green Fund, which invests in renewable energy, energy efficiency and resource productivity companies in North America and Europe. In 2012, a separate emerging markets growth fund was created to focus on opportunities in developing countries. Climate change has been a particular concern for Branson, who is reportedly influenced by the writings of former U.S. vice-president Al Gore and Gaia theorist James Lovelock. One initiative founded through Virgin Unite in 2009 is the Carbon War Room, which works to break down barriers that prevent capital from flowing to entrepreneurial climate solutions. 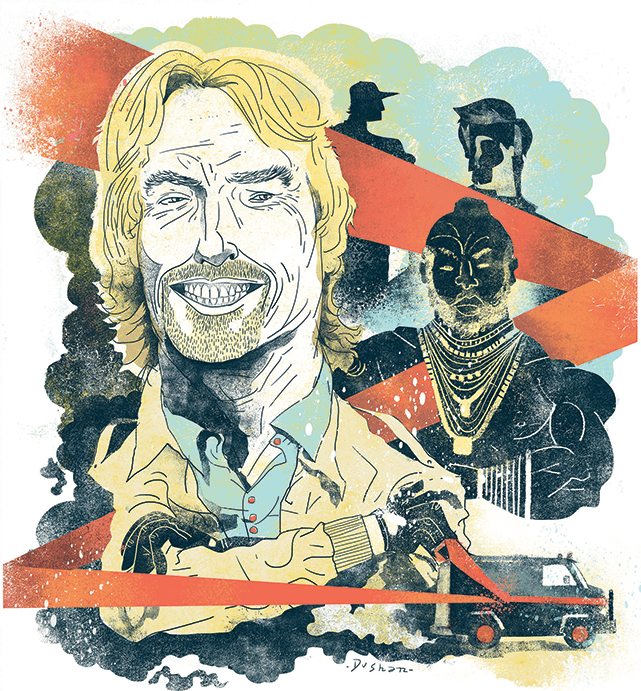 Branson’s latest project is The B Team, an assembly of international CEOs and business leaders who believe social and environmental gains are paths to financial gain. Co-founded last October with Puma chairman Jochen Zeitz, the team will champion “concrete solutions to help make capitalism a driving force for social, environmental and economic benefit” – similar in purpose and design to the Council for Clean Capitalism, which Corporate Knights is spearheading in Canada. CK: What gave you the idea of The B Team and why do you think it’s important to pursue it? BRANSON: Business needs a better future – one where its purpose is to be a driving force for environmental, social and economic benefit for all. Business today is focused on short-term quarterly profits and willfully ignores the natural resources that it takes from the planet without replenishing those resources or developing renewable sources of energy. There is a better way. We can adopt a vision for building better businesses that protect people and the environment – while making money. That’s the challenge for this generation to solve. Otherwise there won’t be a planet to do business. That’s what the “b” in The B Team stands for – business done better. CK: What does The B Team hope to accomplish over the coming few years? BRANSON: In the next few years, our mission is to set up “challenges” that the B Leaders are committed to tackling and that are currently standing in the way of business being a driving force for social, environmental and economic benefit, motivated by people, planet and profit versus just profit alone. The challenges we select will be of varying risk levels but all have a common hurdle: defining new rules and models for the future of business. We plan to launch our first three challenges later this year and have already gotten a lot of feedback. CK: What would you list as some of the barriers to what some call sustainable or “clean” capitalism? BRANSON: One barrier is the common belief that there is a trade-off between doing well financially and being of benefit to the world. We believe that business can redefine its own terms of success by including the environment and people. We have been working with our advisory group and the global community across areas including finance, human rights, new corporate forms, well-being and education to define the barriers and structural constraints that need significant re-thinking if we are to achieve our vision. CK: Do you sense, given recent climate-related events around the world and growing concerns about resource scarcity, that there’s a clear shift in the way big business is treating environmental and social justice issues? BRANSON: It has been encouraging to see such greater awareness from the public about the environmental and health issues that continue to worsen because of our current energy consumption and our addiction to fossil fuels. Government is starting to wake up thanks to the alarms rung out by politicians such as [New York City] Mayor Mike Bloomberg and New York Governor Andrew Cuomo. While businesses must continue to measure and pay for their environmental impact and carefully choose partners with clean energy practices, governments are steps behind and must show much more commitment to their people and our future by ending subsidies to fossil fuels and encouraging greater and much faster development of our many renewable energy sources.